This is a clone of the Arduino UNO R3. It is compatible with standard UNO shields and with the Arduino IDE. 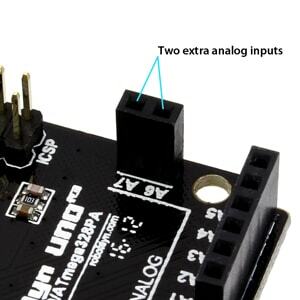 This board includes two additional analog-input pins, A6 and A7, which are not found on traditional UNO boards. Both of these pins are analog-input capable and have a female header for easy connection. The board has a micro USB connector for connecting the board to a computer. The board has an on-board CH340G USB to serial (UART) converter IC. You will need to install a driver for your computer to recognize the on-board CH340G USB to serial converter (find driver download below in the resources section). If you are using Codebender online you do not need to install a driver. NOTE: The Tx and Rx LED labels on this board are swapped. 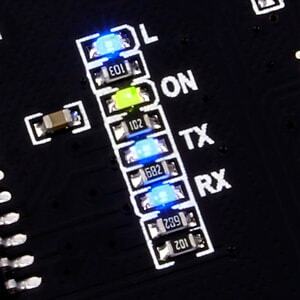 Therefore, when you are sending serial data to this board the Tx LED will light up instead of the Rx LED. There is no functional problem with the serial (UART) pins. The Tx and Rx I/O pins are positioned and labeled correctly. You will need to install a driver for your computer to recognize the on-board CH340G USB to serial converter. If you are using Codebender online you do not need to install a driver. Addicore tested product. I trust their products! I live only minutes from their office, great service, and I can pickup within hours of placing an order. Way faster than the slow boat from China. It was out of stock however the contacted me when their shipment came in, did I mention the great service? For price and quality, cannot complain. Ordered others in the past and still functioning as expected. I always keep one as a bench mark for comparable to other clones and compatibles. Can't beat the price. I've had reasonably good luck with various Arduino-clones. This one doesn't disappoint. These are fully functional UNO clones. I have used many of them for various projects.